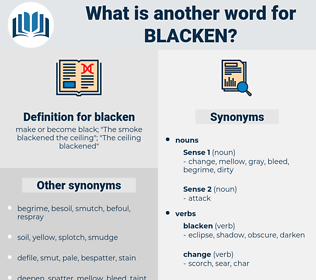 What is another word for blacken? 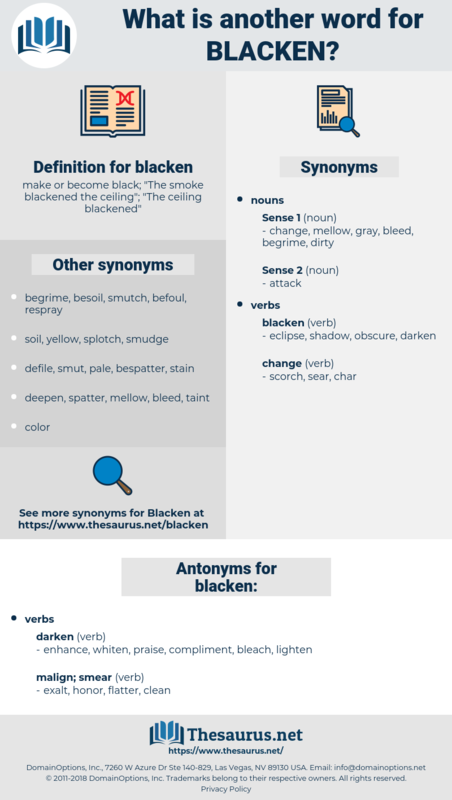 make or become black; " The smoke blackened the ceiling"; " The ceiling blackened"
enhance, whiten, praise, compliment, bleach, lighten. esteem, glow, acclaim, purge, venerate, unveil, worship, renew, freshen, spruce, beam, dawn, brighten, glorify, light, regard, tidy, wash, straighten, decontaminate, adore, expose, dry clean, deodorize, brush, scour, commend, shine, sweep, dust, scrub, wipe, uncover, applaud, rinse, admire, respect, reveal, revere, launder, purify, mop, sanitize. History of this time was recorded by Germans chiefly, and they have spared no trouble to blacken Ottokar's character, by which process Rudolph of Habsburg is made to stand out as a light shining in the darkness. Do not blacken nine and ten and eleven, and all between, with the colour of twelve.